In May 1782, a flamboyant character graced the King’s Theatre Masquerade in London. Gliding his way past the Venetian sailor, the gentleman in a coat of two different colours, and the usual unremarkable costumes of some eight hundred attendees, the High German Doctor cut a dashing figure. He introduced himself to the gathering as ‘Le Sieur Francois de Migraine, Docteur en Medicine’. Monsieur Le Medicin, Attributed to Sir Henry William Bunbury (1771) Credit: Metropolitan Museum of Art. Sansanietto the High German Doctor (1772). Credit: The Trustees of the British Museum. Reproduced under a Creative Commons CC BY-NC-SA 4.0 license. 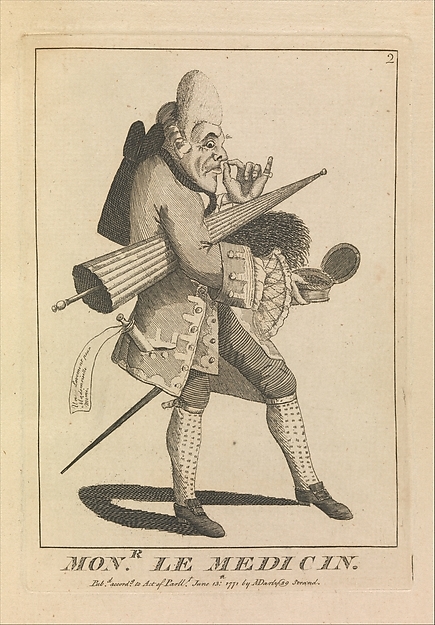 Sir William Bunbury’s famous caricature of ‘Monsieur Le Medecin’ (1771) with his carefully powdered wig, his snuff and parasol gives a sense of what our character may have looked like. 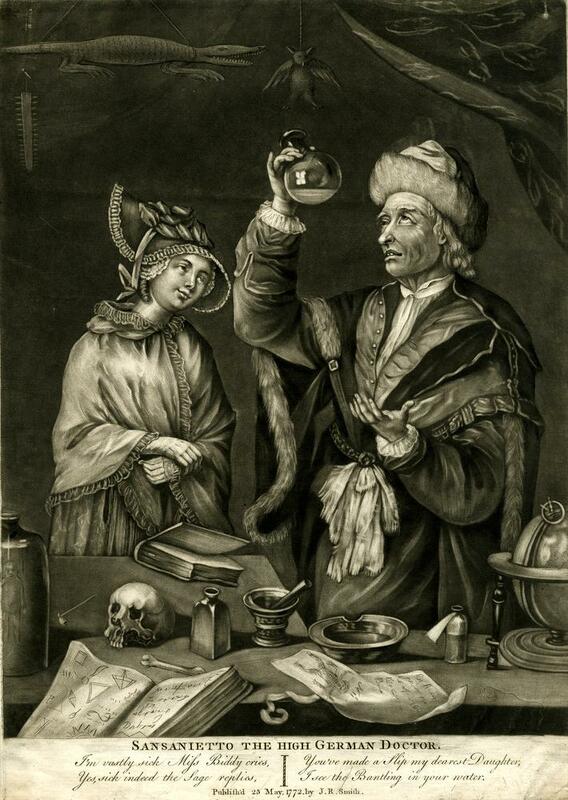 Another contemporary print depicts ‘Sansanietto the High German Doctor’, dressed in fur, inspecting a flask of urine under the watchful gaze of a young woman. Masquerades are one of the stereotypical cultural elements of the eighteenth-century; these were notorious social gatherings, lavish expressions of parody, debauchery, excess and ‘perverse foreign fashion’. It is hardly a surprise, therefore, to see medicine mocked in such a situation. To call someone a ‘High German Doctor’ in the eighteenth century was to accuse him of quackery. Earlier in the century a satirical broadside entitled ‘The High German Doctor and the English Fool’ extolled the skills of a physician who could cure Kings of tyrannical fever, Cardinals of pride, laziness and hypocrisy and Popes of ‘anti-Christian evil’ with his infallible pills, umbilical sticking plasters and pots of mollifying ointments. I’ve been wondering what to make of Le Sieur Francois de Migraine. Is he just a humourous miscellany in my history, or does he represent something more significant? I’m beginning to think the latter because something happened to migraine in the late eighteenth century; it began to gain a personality of its own, an identity that went beyond mere symptoms. In the summer heat of August 1787, for instance, the General Evening Post described how ‘half Paris had the migraine, and no lady of fashion could be prevailed upon to quit her boudoir’. Migraine was acquiring a character. Moreover, this character was distinctly continental, and thus in its flamboyance, its wilting Parisian nervousness and its effeminacy, it became suspect. This identity emerges from the pages of newspapers and the letters between patients and their physicians and it is important, because I think it begins to explain one of the key issues that we continue to grapple with today: although accepted as ‘real’, headache disorders are nevertheless chronically under-funded, sufferers often ignored, dismissed and blamed. This is what the sociologist Joanna Kempner has termed migraine’s current ‘legitimacy deficit’. Yet, looking back over several centuries, this does not always seem to have been the case: in the medieval and early modern sources that I have looked at, discussions of migraine were often matter-of-fact: migraine was a well-recognised illness, it was taken seriously, people offered strategies to deal with it, with little hint of the gender bias that emerged from the nineteenth century. So at some point, migraine stopped being taken so seriously. As we can see here, it even became a joke. Why does this matter? Because Le Sieur Francois de Migraine represents, perhaps, the beginnings of our own highly gendered way of understanding – and dismissing – this illness. Nice website will search more on there. History helping better understanding of human approach in tha past and recent science elevation.